I thought I'd post a little note about Robert Altman's 'A Prairie Home Companion'. I've been a fan of the radio show the film is based on since I heard it on JazzFm in Toronto about 6 years ago. 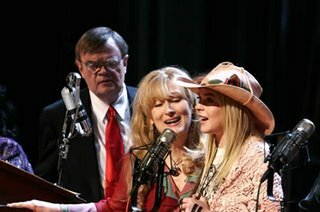 It's a Radio Variety show that features tidbits of scetches, local music (not always Country), and Garrison Keillor's evocative and humourous Lake Woebegon monologues. The film is a whimsical imagining of the backstage happenings on the show's last performance. The theatre's been sold and the purchasing corporation is trading in the Radio show for a more profitable parking lot. The film features Keillor and some of the regulars on the actual Radio show and adds in some fictional characters to flesh it out. What's great about the film, outside of Keillor's dry and quirky script, is Altmans fluid direction. Like fellow great American filmmakers Orson Welles and Woody Allen, Altman allows the dialogue to flow, allows actors to step on each other's lines and allows for room to breath in the scenes. Film is about cutting, yes. It is also about staging and blocking. Often the limitations of the microphone get in the way of letting the actors 'play' the scene. It doesn't have to be a staccato cutting of lines. To let a scene play isn't to make it less cinematic. Watch Woody Allen's Manhattan or Annie Hall (or any other for that matter) as he lets the actors move through the scene allowing for greater freedom for performance. Welles, who was well known for his filmic bravado, would also make room for the actors. His later work became much more kinetic in terms of cutting but his use of sound and dialogue evokes the stage where people talk over one another. A Prairie Home Companion stands out in the current crop of films and reminds us that there still are unique voices in film. It's inspiring. I am looking forward to seeing this one, Mark.